Fewer than 1 in 3 employees in the workforce today describe themselves as “engaged.” And more and more, engagement, or lack thereof, is cited as a reason people leave jobs. How do you foster engagement and when does it start? Ideally, every new employee would be fired up and engaged at the get-go. One thing has come to the forefront in simplifying and assuring a consistently superior onboarding experience: comprehensive people management technology that includes not only automating recruitment, but also everything that happens thereafter—starting with onboarding and also encompassing functionality like payroll, benefits administration, goal creation, performance assessment, and career development. 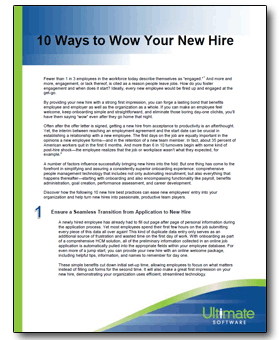 Discover how the following 10 new hire best practices can ease new employees’ entry into your organization and help turn new hires into passionate, productive team players.